Enjoy free entertainment with the Band of Heathens in Downtown Luckenbach at 8 pm. Please call 830/997-3224 or 888/311-8990 for more information. Sale & auction at Fredericksburg Inn and Suites. Call 830/644-2166 for location and more information. Fall Creek Vineyards is honored to host cheese authority, Paula Lambert, for a sumptuous three-course luncheon. This luncheon is a single day event as part of the Third Annual Fall Fest and Wine Auction. Cost for the luncheon is $40 per person, all inclusive. Please call 325/379-5361 or 817/424-0570 to make your reservations or for more information. Fall Creek Vineyards is centrally located on the northwest shores of Lake Buchanan in Tow, Texas. Howl at the Luckenbach Moon with Quincy Harper and Carley Wolf at 8 pm. Please call 830/997-3224 or 888/311-8990 for more information. Learn to prepare at home the light, healthy cuisine served in world renowned spas. This Fredericksburg Cooking Academy class is taught by Mary Kaye Sawyer Morse on November 1, from 6 pm to 9 pm. Call (830) 997-6848 for more information. Wear your best "Fright" for the Night or come as you are to Trois Estate at Enchanted Rock, 16 Miles North of Fredericksburg on RR 965. Celebrate, visit, dance and eat, featuring High Water Crossing Jazz Trio. Cost is $50 per person, tax and gratuity included. Please call 830/685-3090 for reservations and more information. Progressive Farmer’s 2007 Idea House is located in Gillespie County, nine miles northeast of Fredericksburg in Cool Water Ranch, located on Sultemeier/Moellering Road, off Ranch Road 1631. The home will be open to the public for touring until October 28th --- Wednesdays through Saturdays from 11:00 a.m. to 5:00 p.m. and on Sundays from 1:00 p.m. to 5:00 p.m. The cost is $5. It is the fifth such home to be built across America by Progressive Farmer. Visit the site above for more information or call Fredericksburg Realty at (830)997-6531. An in-store scrapbook retreat this Friday at Journey Lane Scrapbook, that is sure to inspire you, cost per person is $75 and includes the following: Friday evening meal, all meals on Saturday, breakfast & lunch on Sunday, & tools available for use. Additionally, supplies will be available for purchase, and projects may be left overnight - no need to set-up multiple times. Scrapbookers may come and go as they wish and work on their projects at their convenience. If this sounds likes something you'd enjoy, please call (830) 990-6942 for further info or to reserve a spot. The Pedernales Animal Welfare Society (PAWS), in conjunction with Lincoln Street Wine Market, will be holding a fall "Hunk" Calendar signing. PAWS 2008 Hunks will be on site to sign calendars. Enjoy complimentary appetizers, along with live music. Lincoln Street offers a large selection of wines for your enjoyment. PAWS is a non-profit, all volunteer animal organization with a mission of ending pet over-population through free spay/neuter services and public education on responsible pet ownership. Proceeds from the calendar will benefit PAWS mission. Please call 830-990-1018 for more information. Come dressed as a grape or just your favorite character at Chisholm Trail Winery's costume party. Enjoy live music by Bill Smallwood and prizes for the best costumes. Please call 830-990-2675 or toll free 877-990-2675 for more details. Dance to the Amber Digby Band at the world famous Luckenbach Dance Hall. Cost is $5 at the door with children 12 and under free. Please call 830/997-3224 or 888/311-8990 for more information. A masquerade party (for ages 21 and over) will be held at the Nimitz Ballroom on this Saturday, October 27, starting at 7:00 p.m. with hors d’oeuvres, cocktails and costume contest. Cost is $25 per person. For more information, call (830)992-2745. Cooking class with visiting chef, Molly Fowler, the Dining Diva, held at Runnymede Country Inn, from 6:30 - 9:00 PM. Wine will be paired with each course. $40/person. Call 830-990-2449 for information and reservations. Come to our Soto & Schmidt's Open House next Friday, October 26. They carry their own collection of fabrics - upholstery and drapery. They will have overhead lighting, lamps, wall decor and an extensive array of items to create a home. Gloria & Fred Soto have taken their design experience and for the last year have been shopping for unusual antiques for today's lifestyle and appropriate to be used in today's homes. In addition to antiques, they have antique reproductions. Each season will bring decor, as well as unique holiday decor. There are gourmet food gifts, as well as other gift items. There is a baby corner of soft blankets and hand embroidered baby pillows. Also, there is a selection of faux florals and green to "make your own" arrangements, as well as extraordinary florals designed and completed by Gloria Soto. She will also custom create florals. Soto & Schmidt is at 232 W. Main Street. August E's and Fischer & Wieser Specialty Foods collaborate at Das Peach Haus for a special celebration of food and wine. Cost is $50 per person by reservations. Seating is limited so do not hesitate. Please call 830-997-8969 to make reservations and for more information. Cooking class with visiting chef, Molly Fowler, the Dining Diva, held at Runnymede Country Inn. $35/person. Call (830) 990-2449 for more information. Cotton Gin Restaurant is hosting the Food and Wine Festival Vintner Brunch, Sunday, October 28, 2007, from 11:30 a.m. - 1:30 p.m. The price is $45 per person plus tax (advance reservations required). Call 830-990-5734 for more information. Authors Kaye Abikhaled and Louise Sevasin will be at the National Museum of the Pacific War to sign copies of their books: Childhood in the Third Reich and Children and War. Please call 830/456-6997 for more information. Join Wildseed Farms for Monarch Butterfly tagging and release. Listen to speakers on the life cycle of the butterflies and their migration patterns - 9:30AM - 6:00PM. Call (830) 990-8080 for more information. 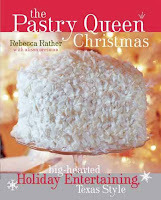 Pre-order The Pastry Queen Christmasbefore October 25th and save 15% off of the cover price! E-mail your request with name, phone number, and number of copies (pre-payment not required) to Villa Texas, 234 West Main Street, Fredericksburg, TX 78624. On November 10, Villa Texas will open early and Rebecca Rather will be signing her book. Call Villa Texas at 830.997.1068 for more information. Bell Mountain Wine Tasting Room at The Shops at Rocky Hill, 6264 Highway 290 East, 5 1/2 miles East of Fredericksburg is featuring food samples from Fischer & Wieser Specialty Food and Der Kuchen Laden from 2:00 - 5:00PM on Thursday, October 18. Please call 830/997-9750 for more information. Gallery Showing of "Two Views of Loss: New Orleans"
View the artistic interpretations of New Orleans after Hurricane Katrina of photographers Jill Skupin Burkholder and Dan Burkholder. The gallery at Photography 414 will show "Two Views of Loss: New Orleans" Wednesdays - Saturdays through November 3, 2007 from 11:00AM - 6:00PM. Please call 830/990-1330 for more information. Celebrate new releases or revisit old favorites as autumn begins in the Texas Wine Country. Purchase your passport and receive the year's unique collectors' t-shirt. Visit only ten of the participating wineries and become eligible for the drawing, for cases of wine! The trail runs from October 1 to 31. Wildseed Farms will host the Monarch Butterfly Celebration from 9:30 a.m. to 6:00 p.m. this Saturday and Sunday. There will be speakers on the life cycle of butterflies and migration patterns. Monarch butterflies will be tagged and released. Join `Swami’ Swaminathan for a global culinary experience as you learn to prepare an Indian meal while savoring the flavors and customs of India at the Fredericksburg Cooking Academy on Sunday October 20, from 2 pm to 6 pm. Call (830) 997-6848 for more information. Enjoy the Hill Country Ranch Rodeo and Mercantile and Cowboy Emporium Vendor Show at the Fredericksburg Expo Center Arena. Vendor show, rodeo and dance all in one place. Please call 325/347-5815 or 830/997-8994 for more information. View homes in Cypress Springs Estates. Purchase presale tickets for $8 or the day of for $10 and children 12 and under free. Call 830/895-5424 for tickets, location and more information. Take the time to visit the Vereins Kirche Museum on Marktplatz and view the photo display of the thirteen saloons that were on Main Street in the early days of Fredericksburg – places like The White Elephant Saloon, The Nimitz Saloon, the Rudolph Itz Saloon, the Sliver King Saloon, the Capitol Saloon and The Klaerner Saloon to name a few. The exhibit was researched by Bill Teague. Historic research shows that music, singing, dancing and drinking have always been a part of Fredericksburg’s heritage. It is a 'Bad Day in Luckenbach', when they honor John "Bad McFad" Raven from 1:00 - 5:00PM. Starting at 8:00PM join Tommy Alverson for a CD Release Party. $10 at the door with children 12 and under free. Please call 830/997-3224 or 888/311-8990 for more information. A blood drive for the military will be held in Fredericksburg on Tuesday (10 AM to 3 PM), Wednesday (2 PM – 7 PM) and Thursday (2 PM – 7 PM), October 16, 17 and 18, 2007, at the National Guard Amory, 598 Armory Road. Did you know that if the military runs short of blood, they have to purchase it? We as a community are joining our hands together to do our part in Supporting Our Troops with The Ultimate Care Package. Walk-ins are welcomed but if you want to schedule a specific time to donate, please click on the related link and type in the zip code 78624 or dates of October 16, 17 or 18. See you there, and remember one donation can save up to 3 lives. To schedule an appointment on-line go to: www.militarylifeforce.com . For more information contact Bobby Sagebiel, at 830-990-6986 and leave a message. Torre di Pietra Vineyards celebrates Columbus Day this weekend. Live music on Friday and Saturday from 2:00 p.m. to 6:00 p.m., with a cooking demonstration by Executive Chef Ross Burtwell on Saturday at 1:00 p.m. Bocce Ball Tournament on Saturday from 10:00 a.m. to 6:00 p.m.
Water2Wine, a custom winery, is open at 228 West Main Street. The local franchise is owned by Mike and Cathy Clay. Other locations in Texas include Austin, Houston, Boerne, New Braunfels, Round Rock, and Castle Hills, as well as Denver, Colorado, and Fresno, California. Enjoy this benefit for the Gillespie County Republican Women at 11 am at Bethany Lutheran Church, 110 W. Austin Street. Please call 830/997-7080 for more details. Tommy Alverson will be celebrating his newly released CD “Country to the Bone” at Luckenbach on this Saturday, October 13, starting at 9:00 p.m. Tickets are $10 at the door. Come to Fredericksburg’s Annual Knap-in & Lithic Arts Festival! This festival is best described as a gathering of men & women who share a passion for making arrowheads, spear points, & art objects made from obsidian chert & other types of stone. Over 500 participants gather for three days & knap flint. There are constant demonstrations going on for beginners & many vendors selling beautiful items made from stone. This is a great family outing! The Festival will be held on the grounds of Fort Martin Scott, a pre-Civil War era frontier fort located just east of Fredericksburg on Hwy. 290, very near to the Wal-Mart & directly across the highway from the Fredericksburg Law Enforcement Center. Click the “Map/Directions” link above to get Fort Martin Scott’s location map. There is a fee to be a registered attendee; but it is FREE to the public with the exception of a $3/per carload parking fee. For more info about Fort Martin Scott, visit the fort’s website or call 830/997-9895. Chef Jacque' Rudman presents "Harvesting Nature", enjoy this "Chat-n-Chew" lunch and learn the basics of "how to" pickle, marinade and preserve our delicious fall harvest. $35 per person includes cooking instruction, tasting and copies of all recipes. Please call 830/456-1174 for more information. 10K walk starting at 8:00AM. Registration is at 7:00AM Call 830/997-2533 for location and more information. Pecan Creek School and Community Center will be open this Saturday, October 6, from 11:00 a.m. to 4:00 p.m. One of Gillespie County's historic country schools will be open the first Saturday of each month for informal tours. Directions to Pecan Creek --- out U.S. Highway 87 north to Old Mason Road and then to Pecan Creek Road. Maps showing the country schools locations are available at the Fredericksburg Visitor Information Center, 302 East Austin Street. Soto & Schmidt has opened at 222 West Main Street. Hours are 10:00 a.m. to 6:00 p.m. Mondays through Saturdays. The new store carries antiques ideal for modern day living and décor, fabric samples to choose custom draperies and upholstery, jewelry, clocks, florals, lamps and much more. Call (830)992-3517 for more information. Photography 414 will hold an artist reception this Sunday, October 7, from 2:00 p.m. to 5:00 p.m. for “Two Views of Loss … New Orleans.” The photographers are Dan Burkholder and Jill Skupin Burkholder. The gallery is located at 414 East Main Street. Call (830)456-9503 for more information. Dance to the Bobby Duncan Band at the world famous Luckenbach Dance Hall at 8 pm. Cost is $5 at the door with children 12 and under free. Please call 830-997-3224 or 888-311-8990 for more information. Hill Country Children's Theater Production "Wonderland, Alice Returns"
Hill Country Children's Theater announced that tickets are available for their upcoming show, "Wonderland, Alice Returns". The play will run September 28-30 at at First Presbyterian Church in Kerrville, Texas. Showtimes are 7:30PM, except for Sundays when there will be a 2:30PM matinee. Tickets are $5 in advance and $7 at the door. Please call 830/990-5752 for more details.